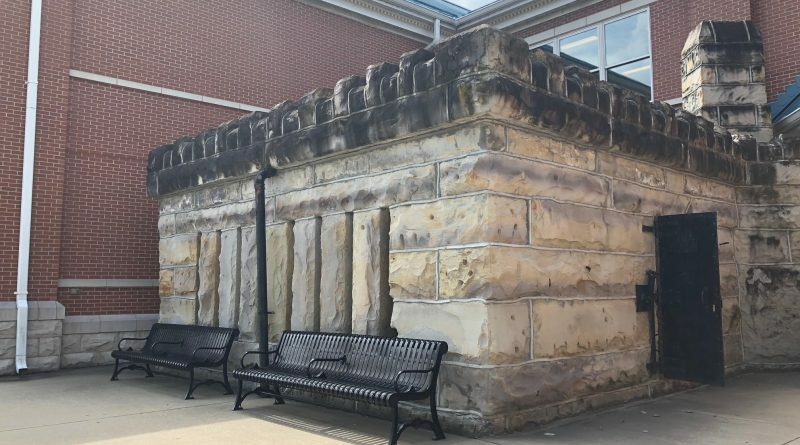 Built in 1891 by the McDonald Brothers, the Old Stone Jail was made from sandstone blocks. The building was 22 by 22 square feet and consisted of four cells and a hallway. With no insulation, the winters were brutal, and the summers were torture for the guests of ‘The Stone Mansion.’ The most notable inmate of the jail was Marie Thompson. Marie was a black sharecropper who lived on the land of a man named John Irvin. On June 14, 1904, Irvine confronted Marie and her son about a tool that they had borrowed. Even though they insisted they returned it, John accused Marie’s son of stealing it and began hitting him. Marie was enraged and started attacking John. John was furious and demanded that Marie and her son leave, and he evicted them from his property. As Marie walked away, she taunted John and walked very slow. John couldn’t take anymore and pulled a knife on Marie. However, Marie was a very large woman, and she used her size to overtake him. Marie stabbed him with a razor she was carrying and killed him instantly. Police came and arrested Marie and took her to a jail in Lebanon Junction. Later that night a dozen white men used a sledgehammer to break the lock off the jail door and attempted to lynch her. Their attempt was thwarted when a large group of black men showed up and started firing their guns. The sheriff showed up a little later and did his best to keep the peace. He promised both sides that Marie would get her day in court and justice would be served. Both groups left, and the trouble was over, or so it seemed. Early the next morning a group of 50 white men went back to the jail while the town slept. The mob placed a rope around Marie’s neck and dragged her out of her cell. As they threw the rope over a tree branch and began to pull her off the ground, Marie grabbed a knife one of the men was carrying and cut the rope. When she hit the ground, Marie started to run away, but it was too late. The mob started firing their guns, and she had been hit several times. When the sheriff arrived, he sent the mob home again and went to examine Marie’s body. To his surprise, Marie was still breathing. The sheriff took her to the doctor to have her wounds seen about. When she was released, Marie was taken to the Old Stone Jail in Shepherdsville. Some reports say she died there later that day. Some locals claim she was tried, spent time in prison and was eventually released. Either way, it is a horrible stain on local history. In 1947 the Old Stone Jail shut down. In the 1990s after some renovations, it was reopened as a tourist attraction and is available for self-guided tours during business hours. Due to all the history at the Old Stone Jail, it’s no surprise that many believe it’s haunted. Strange noises have been heard in the jail at night and orbs have been captured in photographs. Some locals have claimed to see the apparition of a man in one of the cells. For more about the Old Stone Jail you can take a ghost tour in Shepherdsville with the Louisville Ghost Map in the iTunes App Store. With over 60 places to explore around Louisville you will have a lot to keep you busy.